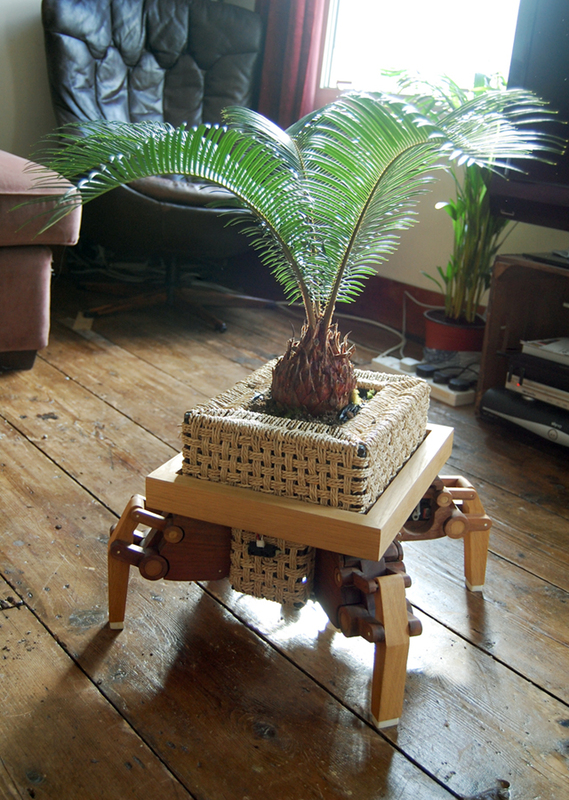 The Play Coalition created Plantbot, a servo powered planter. 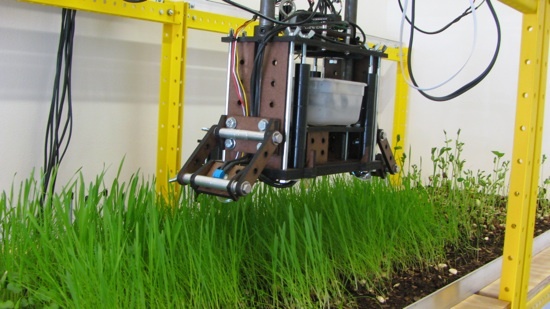 The idea is that the planter continuously tracks the sun, ensuring that the plant get maximal sunlight. My initial impression was that this was a really cool idea, but when I started thinking about it, it seems like yet another one of those ideas that are utterly impractical. I mean, do you really want furniture that constantly moves? Well I guess a dog is kind of like that, but it doesn’t immediately back to the same place. In all honesty though, that’s an engineering problem. An accelerometer to detect pickup and not move for some time after being placed back down. I guess the other thing is having it move back to its original position each morning. 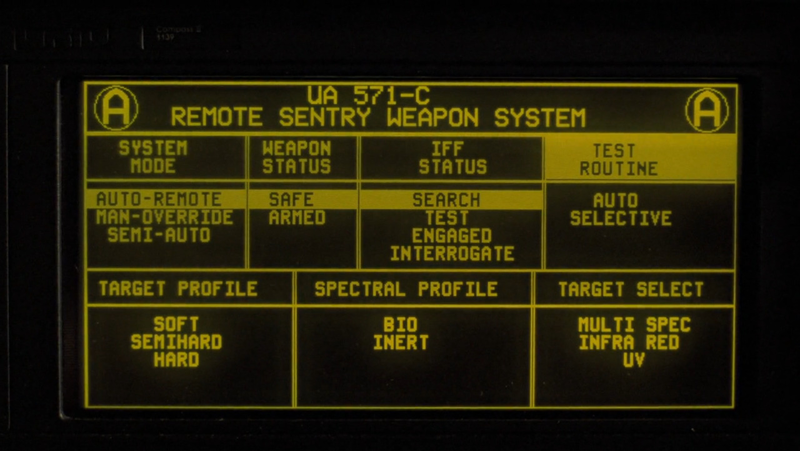 Well, I guess that’s just a search pattern. So, I guess none of this is that big of a problem. This entry was posted in installation / sculpture, tech and tagged petersand, plants, playcoalition, robots on May 26, 2009 by jonathan. Swiss Miss links to Kurt Riedi and Steffi Gloor’s weather site. Each forecast is presented as a photograph illustrating the qualitative weather for the day. Browse them all. 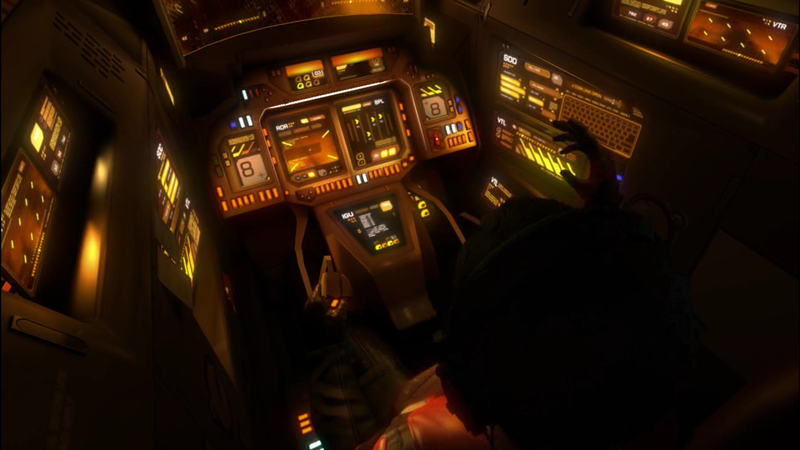 This entry was posted in animation / interactive / film, tech and tagged kurtriedi, steffigloor, weather on May 26, 2009 by jonathan. Ahh, Berlin… The city with the best street art environment of any city I’ve been in. 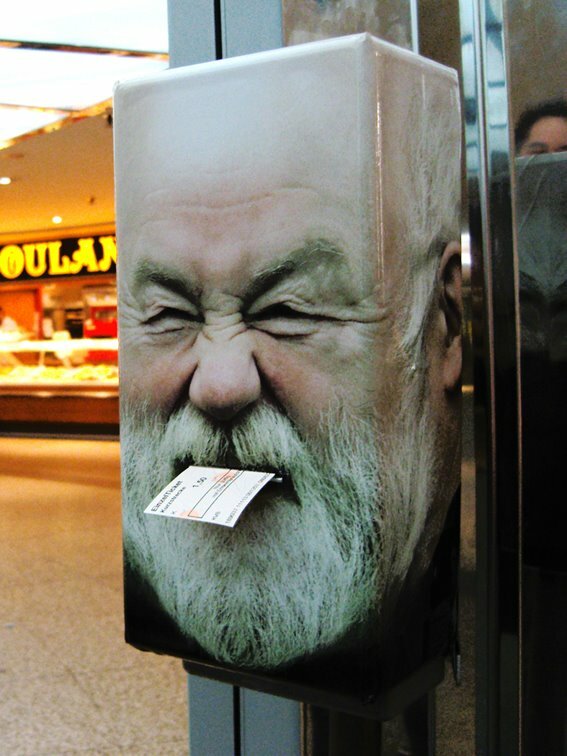 Berlin’s Mentalgassi installs pasteups of wraparound photos of persons’ heads over common items in the urban environment. I love the playful interaction of the faces with the ticket validators. It’s just clever. This entry was posted in street and tagged berlin, mentalgassi, pasteup on May 25, 2009 by jonathan. Dan Goods, artist at JPL, recently curated the Data + Art exhibit at the Pasadena Museum of California Art. (Show ran from January to April 2009.) 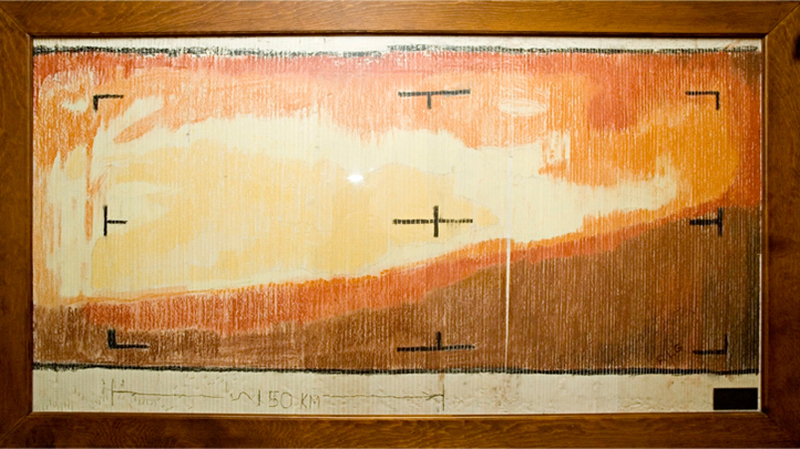 As part of this exhibit is the crayon shaded printout of raw data from the Mariner 4 of the first image from Mars. I like the very low tech solution to rendering the image, but I do find it a strange when compared to the processed image. 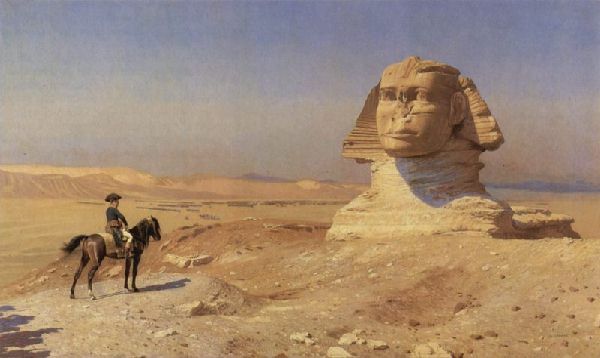 Perhaps it’s because of the colors of the crayons used, but the colored image makes the image appear like a landscape. If this was a Viking image, I wouldn’t have thought anything was strange, but Mariner 4 was an orbiter. In the processed image, the planet doesn’t even appear to fill the entire frame. This entry was posted in illustration and tagged dangoods, data+art, mariner3, mars, pasadena on May 22, 2009 by jonathan. 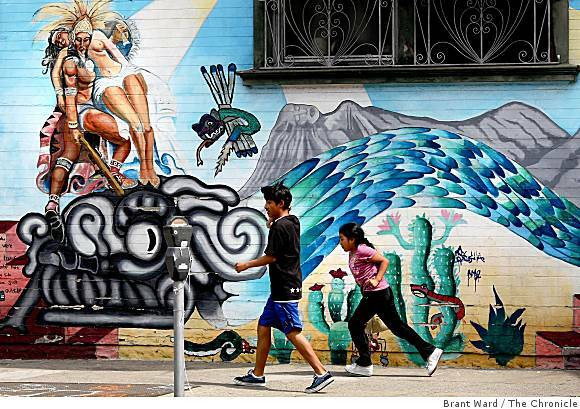 The Chron highlights some of the murals of The Mission in San Francisco. Murals are pretty common in The Mission, but this list highlights some of the best. This entry was posted in street and tagged graffiti, mission, sanfrancisco on May 18, 2009 by jonathan. Festo creates these as part of their Bionic Learning Network. This project models natural animal systems in an effort to develop lightweight, and energy efficient designs for manipulators and locomotion. As a side effect of this research, Festo creates these robots in order to demonstrate the effectiveness of this approach. 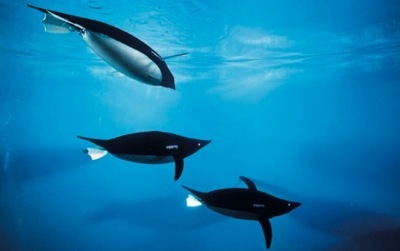 This entry was posted in installation / sculpture, tech and tagged festo, jellyfish, penguins, robots on May 6, 2009 by jonathan. 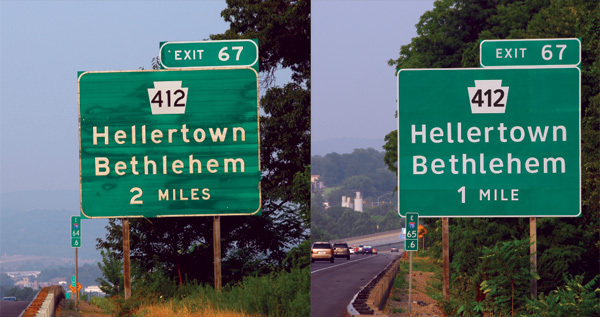 The US Department of Transportation is changing the highway sign font. Out with Highway Gothic, and in with Clearview. Don’t miss the slideshow that points out the differences between the fonts. This entry was posted in illustration and tagged infrastructure, roads, typography on May 1, 2009 by jonathan.